As we plan for a better future for generations to come, we face many new issues and challenges. My priorities as your State Senator are advancing our education system, creating a fiscally responsible budget, funding Medicaid and CHIP, ethics reform, preserving our environment, and improving our criminal justice system. With this in mind, please take a moment to complete the questionnaire below. 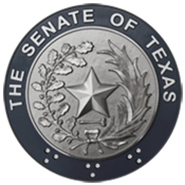 By understanding your concerns, I can better serve you as your State Senator and can be proactive in addressing the future needs of the State of Texas. When you are finished, please click "Submit Questionnaire" at the bottom of this page. NOTE: This survey is not currently compatible with mobile phone displays. Please rank the following issues in terms of importance to you (with "1" being the most important and "8" being the least important). I would support legislation that utilizes the Economic Stabilization Fund to increase the State contribution to public school funding. I would support legislation that creates a Higher Education Enhancement District, which would be funded by an increase of 1/8 cent in the sales tax to be used for scholarships, capital projects, and research. I would support legislation that uses public dollars to create a private school voucher system for primary or secondary school students. I think every citizen has the right to basic healthcare through managed care. I think every citizen has the right to basic health care through health insurance reform. I think every citizen has the right to basic health care through state-funded health care. I would support legislation that guarantees veterans adequate healthcare support from the state. I would support legislation that allows the state to provide tax credits to businesses that offer child care to their employees. I would support legislation that increases payments to nursing facilities that provide care to senior citizens. I would support legislation that increase the Gas Tax to fund a regional rail initiative aimed at reducing traffic congestion and improving air quality. I would support legislation that increases the Sales Tax Cap from the current rate of 6.25% in order to fund a regional rail initiative aimed at reducing traffic congestion and improving air quality. I would support legislation that promotes alternative fuel technology for the State of Texas. I would support legislation that allows concealed handgun license-holders to store handguns on workplace premises. I would support legislation that allows for concealed handguns on college campuses. I would support legislation that prohibits the use of credit scoring to set insurance rates. I would support legislation that prohibits the use of random credit scoring in hiring practices. If you are a member of a mandatory Homeowner's Association, please answer the following. If not, please scroll down to the final section. A. I pay regular assessments as part of that membership. B. I receive a fair value/service in exchange for those assessments. C. When I bought my home or signed my rental agreement, I received adequate notice of my rights and obligations as a member of a mandatory homeowner's association neighborhood/development. D. I have been denied access to records maintained by the association board. E. I have been denied the right to vote in a board election. F. I think homeowner association boards should be subject to penalties when they fail to comply with their statutory responsibilities to homeowners. G. My association uses a private management company to assist the board. H. If your association does use a private management company, did you have input into the decision to hire that company? I. If a homeowner association board elects to foreclose upon your home to recover debts owed to the association, the homeowner should have the option of having a hearing before a judge.